So, please take a moment to look around the new website and let me know what you think. I am sure over the course of the next few weeks, I will be making tweaks here and there, but for now, it’s up and running. What do you think? Let me know! So, I just have to say…THANK YOU! Thank you to all of you who showed support after my last blog post. Yes, I have been struggling, but I think I finally have things under control. For the most part, anyway. Also, to those who encouraged me to keep wearing shorts…THANK YOU! We all have flaws and that’s what makes us, well, us. Because of the comments made here, as well as on Instagram and on a Facebook group I belong to, From Fat to Finish Line, I have decided that I am proud of my legs and what they can do. They allow me to walk, to run, to do just about anything I want to do. So what if they are jiggly on top, full of stretch marks and cellulite and white as a ghost. They are my legs and I am going to learn to love them. 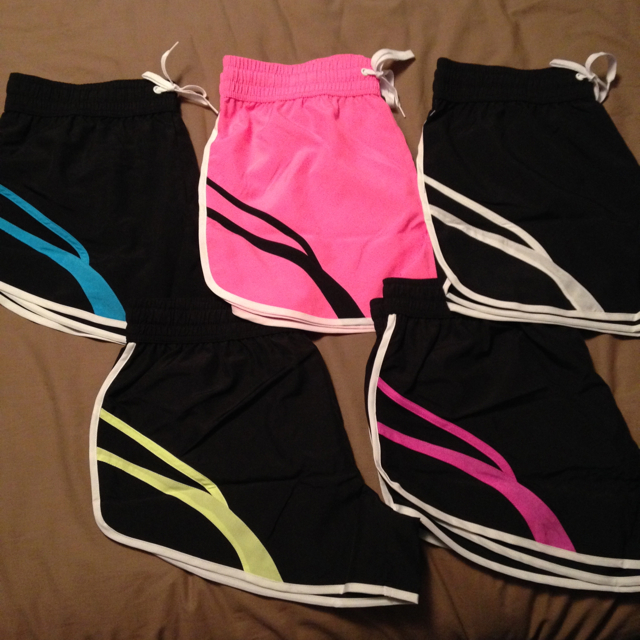 Yep, I found a pair of running shorts I liked and bought them in dang near every color offered. Or at least the colors that will match the tank tops I have! I am going to make this short and sweet for now. I promise to write again very soon. Thanks again for all the encouragement, support and inspiration you all have given me. It surely is appreciated! Remember, leave me some feedback. Let me know what you think about the new website, which by the way, did you notice it has it’s own website now: http://www.confessionsofaformerfatgirlblog.com! Pretty cool, huh? Thanks so much, Dani! Glad you like the colors! Very cool Celeste. I wear shorts with my paste-y white legs, yours can be any worse. Yup! We should all love our legs, because with a little help, they can take us further. Thanks, Jeyna! And you are so right. Our legs can take us further. Love it. Your strong legs have carried you many miles… wear those cute shorts proudly 🙂 Love the new blog look! Thanks, erin! Much appreciated. And yes, they have carried me many miles and will hopefully continue to carry me many more! Next Next post: Holy trail, Batman!